The excellent St John’s Smith Square Young Artists’ scheme featured four young performers for their 2015/6 season (the second), two of them with a focus on early music. As well as being offered three performances in St John’s, Smith Square, the young artists were given development and marketing opportunities and access to a fund to commission a new work or a new edition of a piece of early music. I was able to review two of recorder player Tabea Debus ‘s concert (reviewed here and here) but, unfortunately, could only get to one of the concerts given by the other early music group, The Gesualdo Six, a concert that ended the 2015/6 season at St John’s. England seems to grow all-male a capella vocal groups on trees, and The Gesualdo Six are one such, weaned in cathedral choirs and honed, as is usually the case, by a time at Oxford or (in this case) Cambridge University where some of them are still students. They were founded in 2014 for a performance of Gesualdo by Owain Park, currently organ scholar at Trinity College, Cambridge, who now conducts the six singers. As well as their trademark early vocal music, they also include contemporary compositions in their programmes. Rather enterprisingly, they used the St John’s commission fund to run a competition for composers, resulting in nearly 200 entries from 6 continents. They included four of those entries in this Sunday afternoon concert. Their programme compared music from the Flemish and English traditions over a 100-year period from the sixteenth to early sixteenth century. The first half concentration on Flemish composers, with settings of the Mass by Ockegham, Desprez, Clemens non Papa and de Monte, each paired with another sacred piece by the same composer. Ockegham’s rather low set Kyrie (from his Missa L’Homme Armé) was contrasted with his Intermerata dei mater with its busy inner parts and lively flourish on the words jubilando meremur . Desprez was represented by the tight imitative writing of the Gloria from his Missa da pacem and O Virgo prudentissima/Beata mater. Clemens non Papa’s tiny Sanctus & Benedictus from the Missa Pastores Quidnam Vidistis was contrasted by his O Maria vernans rosa, while de Monte’s equally short Agnus Dei from Missa Emitte Domine was followed by his Domine Deus meus. 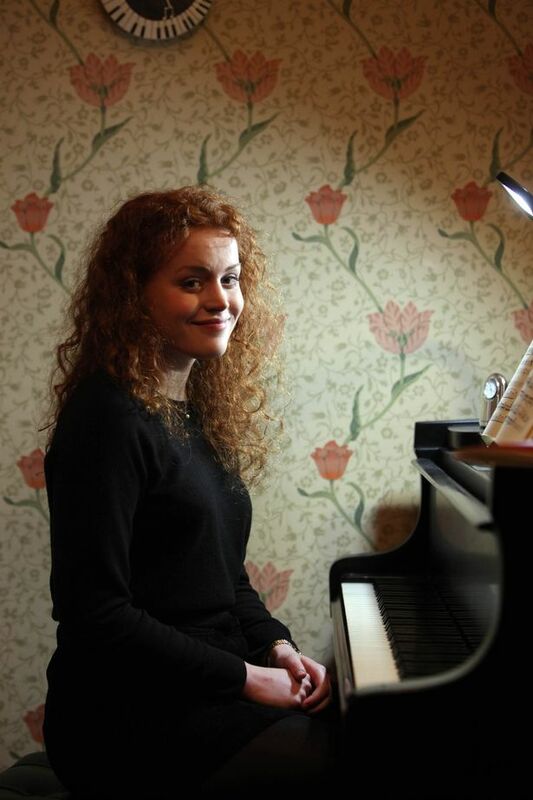 The first half closed with ‘For a number of coins’ by Joanna Ward from Newcastle (pictured, when 16), winner of the under-19 category of the composition competition. This was a setting, in Latin, of Judas Mercator pessimus, from the Tenebrae Responsories for Maundy Thursday, one of the set texts. Using a tight harmonic structure, close intervals and evocative use of dissonance, this was a most impressive work by an obviously talented young musician. Unfortunately she wasn’t there to hear its first performance as she had her physics A-level the following day! The second half concentrated on English music, with pieces by Cornysh (his Ave maria), Parsons (‘Deliver me from mine enemies’), Byrd (Vigilate, and his Mass for five voices), and Tomkins’ ‘When David heard’. They finished with two other pieces from the competition, starting with ‘because my love’ by Sarah Rimkus, an American composer studying in Aberdeen, and one of the most impressive finalists. Her impressive setting of Christina Rossettis’s ‘A Birthday’ used a gently rocking simple folk-like melody supported by drone-like clusters, giving it something of a mediaeval feel. The final work was by the winner of the over-18 category, Phillip Cooke (an established composer and a teacher of Sarah Rimkus), with his setting of Judas Mercator pessimus, also using a moving series of tone clusters, in this case supporting a tenor solo. The tensions and drama of the text were exposed well in this confident setting. The singers of The Gesualdo Six produced a coherent and generally well balanced consort sound, helped by two impressive countertenors, Guy James and Alex Chance whose clean and clear voices sat comfortably on top without dominating. My only query was whether a group like this, with just six singers, really needs a conductor. Although by the standards of some conductors, this one wasn’t overly distracting, his presence in front of the singers meant that for practically everybody in the audience, at one or more of the singers were blocked from view. Details of all the St John’s, Smith Square Young Artists can be found on their respective websites – www.thegesualdosix.co.uk; www.tabeadebus.de; www.jooyeonsir.com; and www.ligetiquartet.com. Details of next season’s Young Artists can be found at https://www.sjss.org.uk/youngartists.